Delonghi ECP 31.21, 33.21, 35.31 review. The right balance of the price, the metal body and the quality + unique milk foam regulator. What I like most about Delonghi company is that its engineers are constantly launching new models trying to fulfill expectations of different customers. While Saeco’s main pump espresso maker Poemia has been produced with minor changes for almost a decade, Delonghi now has a huge model range of espresso makers. Most of them are identical under the hood as I mentioned in Delonghi ECOV310 review. Nevertheless, the outlook, materials used and usability are also important. And the price of course. The Delonghi ECP is an effort to make a cheap coffee maker with metal/semimetal body, which still can deliver good espresso. Plus some bugs fixed if compared to older models. Plus some advanced functions for cappuccino lovers. It is a successor of older Delonghi EC155/156 model. The ECP model range includes Delonghi ECP31.21, 33.21 and 35.31 (in the UK and other European Countries). In USA and Canada slightly different models are sold (ECP3120, ECP3220, ECP3420,ECP3620, & ECP3630, which are descibed below ). Has full metal portafilter. Nevertheless there is still a plastic part inside, it is used to divide coffee into two flows. It could be removed easily if you want. 1) The cheapest De’Longhi ECP 31.21 (on photos) has plastic finishing and have an ordinary milk frother that is still good for cappuccino and has an enough deflection angle. The last fact guarantees that it would be easier for you to froth the milk for your cappuccino. The drip tray is now fixed in its place, so it does not produce rattling noise anymore. Unfixed tray was the most common complain about older Delonghi’s models. ECP31.21 has convenient “twisty knob” controls and a storage place under the top cover. 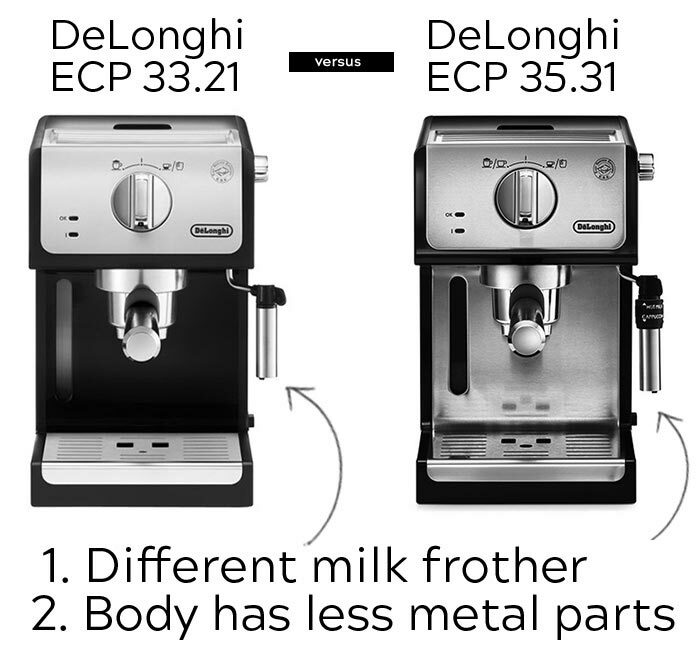 2) De’Longhi ECP 33.21 if compared to the 31.21 has only one difference. It has a little of metal in outlook: the driptray, cup tray with passive heater (it’s not electrical warmer, cup stand is located above the boiler and it becomes warm in a ‘natural’ way), milk frother and the front side are now made of stainless steel. However these parts are most important: it’s easier to clean metal tray and panarello from coffee and milk stains, the metal cup warmer is more efficient since it heats faster and the metal “forehead” helps to keep the heat inside the boiler for a little bit longer. So it’s perfect ratio of price and percentage of metal in coating. Nevertheless it’s the least popular model among ECP series in the UK, for example. 3) Third model is ECP35.31. It’s an “elder sister”. It has more differences. First of all, this coffee maker has full front side made of metal (but still low price 😉 ). Secondly, the panarello milk frother has a regulator ring. Moving it up you can switch to ‘hot milk’ mode, which means you simply warming the milk, not frothing it. This mode could be useful for families with kids (Nesquick) or for preparing special drinks like flat white. Moving the ring down you are switching to the ‘normal’ mode for making a rich foam for cappucino or latte. This function is unique for home espresso makers. Check current prices and deals @ Amazon for Delonghi ECP series espresso makers. Obviously, 31.21 was considered by Delonghi as the cheapest model, the 33.21 – as a golden middle choice, while the 35.31 was planned to be most expensive and luxury version. There is such pricing on other markets, however in the UK there is not much price difference between last two. Moreover, sometimes ECP 3531 costs less than 33.21. Or 3121 gets higher price tag than 3321… So it’s better to check current prices. Added on 27/10/2017: Refurbished items appeared on amazon. Pump espresso maker construction is not a rocket science at all, main parts are quite simple (see photos in my test of Delonghi vs. Saeco). So if you are really short on budget then officially refurbished could be a good choice. However I recommend to make full descaling and washing cycles before making first coffee. 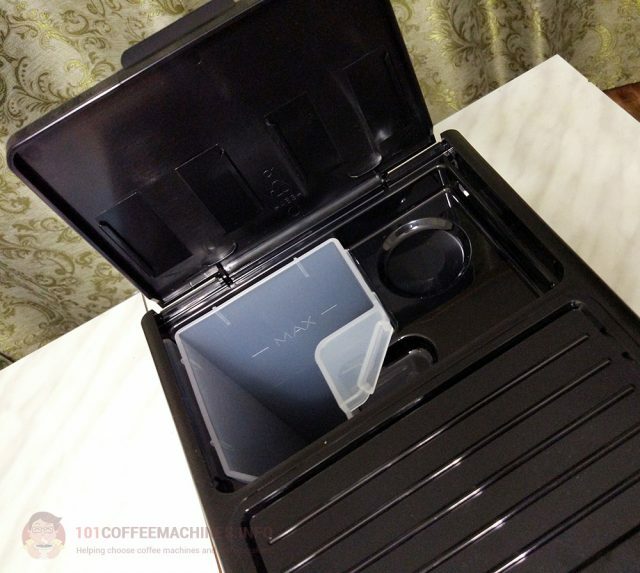 Many owners of espresso machines use the following hint if they want to use higher glasses: remove the main cup stand, and put cup directly on the floor of the drip tray. That allows gaining extra 2-3 cm. Delonghi put a small metal plate on the bottom of the drip tray and now maximum cup height is officially raised to (~4.3 inches). It’s hard to use this mini drip tray for a long time because it’s capacity is literally a few drops. That’s why normally you will use the big one, which limits the maximum cup height to 90 mm = 3.5 inches. New! ECP3120. New variation is announced on the North American market. If compared to all other Delonghi ECP models the ECP3120 is the simpliest one – full plastic body (except for the grouphead), simple panarello wand w/o hot milk mode and no double drip tray (see above). However, there are no taste differences. De’Longhi ECP3220 is the cheapest ‘sister’ in the family. For some reason, some shops call it ‘Deluxe’. However, it is an exact copy of the European ECP 33.21. And it is definitely less ‘luxe’ than ECP3420 (so there is no reason to pay for ECP3220 more). Plastic body with some metal decoration: drip tray and panarello aremade of metal. Nevertheless, it’s still mostly plastic in coating. Body is mainly made of plastic, however, more parts are metallic – the front side almost fully is covered in metal plates. In the case of cup stand (which has a function of the cup warmer as well), it helps to warm cups more efficiently. However, it’s still a passive cup warmer, so don’t count on it much – the stand is located above the boiler it becomes warm in a ‘natural’ way. It’s not electrical. Sides are plastic. De’Longhi ECP3630 is remarkable for the new steam wand installed. The milk frother has hot milk/foam settings, which is described above. In the foam mode, it will froth as simple steam wand does. Switching to the hot milk mode will help you to heat up the milk without frothing it. Everything else in these espresso machines being equal! They differ only by coating (metal parts/colors) and the new steam wand, which is installed on the ECP3630. The second cheapest model with such steam wand is Delonghi EC685 (read my review) which costs much more. I also want to pay attention one more time to the fact that Delonghi Espresso and Cappuccino maker ECP3220/3420/3630 is namely espresso maker, not similar to classic American drip coffee makers. It means it can deliver maximum 60 ml/2 oz (or 90 ml/3 oz being well heated) of coffee of right temperature that is equivalent of two espressos or one lungo. If you want to make an American coffee (e.g. full 200 mg mug of black coffee), you should make an espresso first, than add hot water from steam wand. If you will try to brew a mug of coffee by simply letting a lot of water come through tampered coffee the result would be pour. Because a) the taste will be bitter due to overextraction under high pressure, b) the temperature of the coffee will be low, since Delonghi ECP has a boiler, not a thermoblock inside. If you want an espresso maker with thermoblock, which can deliver more amount of hot water of right temperature, you should check my Delonghi EC680 coffee maker review. For other customers I could highly recommend Delonghi ECP machines as cheap and high quality models. ECP range allows you to choose the right model for you depends on how much plastic/metal in body do you want and what type of coffee you prefer more – simple espresso or cappuccino. Hi , i am going to open up a small cafe shop and i need a cheap one group commercial machine or a normal machine that can run a small cafe , i already know the Nuova Simonelli Oscar but i am hoping to find something a little bit cheaper , we do have here delonghi machines is anything worth buying ? I don’t think that Delonghi ECP will be OK for cafe shop, it’s good for home use, not more. The cheapest decent (with some compromises) espresso makers for small coffee shop would be something like Lelit Anna or Lelit Gilda (try to find models starting with Lelit PL41… or Lelit PL42…). If you want even more affordable option I could only recommend old Gaggia Classic (RI8161, not RI9403). However, in both cases I would rather try to get used Nuova Simonelli (better Appia II model). I am planning to buy a gaggia classic, I think this is one of the best price / quality. I am new to the espresso / coffee world, but I want to learn a lot about barista skills. So I think this is a good machine to start with and I am still good with when I have a bit more experience. Let me know if you recommend another machine. What is the difference between the RI8161 and RI9403? Hi, Dries and sorry for my late reply! Hope it still will be useful. If Gaggia Classic fits your budget then yes, it is one of the best machines for beginners who want to practice more. Especially “old” model – see further. The Classic is a machine of a higher level than De’Longhi ECP 31.21. Thus, I would choose Gaggia, if the price is not the problem. That’s why it’s called espresso machine 🙂 However, you can imitate ordinary American classic coffee by adding hot water from the steam wand in espresso. Hi which one do you think better delonghi ecp 35.31 vs saeco poemia focus? I can find saeco poemia (chinese made, designed in italy) for just a bit higher price than delonghi ecp35.31. For saeco poemia italian made, price is almost 2x . . .
Hi! First of all, Saeco Poemia is now made only in China, there is no italian made versions unless it’s a very old item (which is very unlikely). So it’s probably a mistake in the description by the seller. 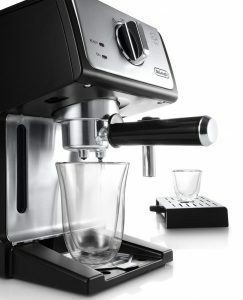 As I mentioned in Saeco Poemia review, it’s better for espresso shots (if compared to modern Delonghi espresso makers with metal filters). However, if you also prefer other drinks (cappucinos for example), 35.31 would be better choice. P. S. Pay attention to the boiler capacity, Poemia Focus in Asia is definetly equipped with new smaller boiler, made of aluminuim, not steel. P. P. S. You could also check this test: http://101coffeemachines.info/compare/delonghi-vs-saeco-vs-hamilton-beach/ Delonghi 35.31 is technically very similar to ECO311, which is described there. If both made in china, then i have no hesitation for choosing delonghi, cheaper, better boiler, and for its cappuccino system. But, I have no idea how the cappuccino system work on delonghi ecp?as you said it better if we need other than espresso, i.e cappuccino. Could you pls explain? Delonghi’s steam wand is easier to use as for me. Small Poemia’s boiler produces less steam and it’s not enough for bigger portions of coffee (>60-80ml, temp falls). However, Poemia will make better classic 30ml espresso shot (or two if well heated), because of better crema filter. That’s why I say that if you drink only espresso – then Poemia. If not only espresso, cappuccinos and lungos, for example, then Delonghi ECP is more universal choice. I like it black, plain coffee, but my wife prefer with milk so i’ll take delonghi for us! Currently my only grinder is porlex tall hand grinder (got it when i was at japan), would that be sufficient to grind for espresso setup? And any idea about delonghi ecp durability? I mainly want a pump machine (so I can easily change coffee as my other half drinks decaff) but mostl for Americanos. I see this has a hot water function but was worried when you mention about the temperature and whether these are good for Americanos? All pump espresso machines have a hot water function, so this is not something special. There would be no problem making an americano. But it’s better two do it in 2 steps iwth a pause between: pour hot water, wait till machine is ready again and brew coffee. Or vice versa. In that case the temperature will be OK. Anyway, since Delonghi’s machines have bigest boilers, it’s the best option among boiler-based makers. Saecos, Mr. Coffee, Hamilton Beach, Gaggia etc – they all have smaller boilers. If you want to make americano faster, then you could think of machines with themoblock: Delonghi EC680/685 or EC820/850. In that case there would be no need to do it in 2 steps and make a pause between theese steps. Thermoblock will almost instanlty make hot water. I tamped the coffee with the furnished tamper but not really hard and no coffee was running. I opened the steamer to let go the pressure and finally heard a “pop”. This was the filter holder breaking on one side. I was wondering, why do they give a tamper if you can’t use it to make a normal expresso ? I had a really old Krups before also with a pressurised filter but it when this happened there was an emergency valve leaking the pressure in the dirty water basket to I guess avoid that it explodes in your head. Any idea where I could get an unpressurised filter because I really hate that now that I have a grinder ? What did broke? 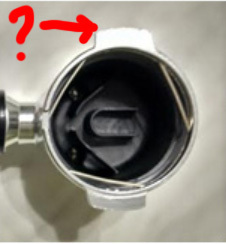 The “ears” of the portafilter, that holds it in the position? Or the whole portafilter itself? Anyway it is not normal at all. Even if the filter would be completely stuffed (e.g. too fine grind level or too much tamped) it should keep the pressure. Not to mention the emergency pressure valve that pours the water out of the boiler back to the water reservoir if the pressure is too high. So, I think that this situation is under the warrnty and this portafilterwill be replaced by Delonghi, if you cantact them. Unpressurized filter basket from older Delonghi models (part number 7313286069) or MagiDeal Coffee 2 Cup 51mm Non Pressurized Filter Basket http://amzn.to/2nm4Biu will fit, but the plastic inner part of the portafilter should be removed (just unscrew one bolt from the bottom). Thanks for the tips for the unpressurised filter basket ! Hi! Thank you so much for your reviews! I am thinking of buying an espresso machine for home use and can’t choose between Delonghi ECP 35.30 and Delonghi EC 680/685. Which would you recommend? I prefer having larger portions of coffee to short espressos. may i know delonghi ecp 35.31 portafilter size ?? hi! may i know delonghi ecp 35.31 portafilter size ?? Hi, I am new to coffee making and interested with the ECP35.31. Based on my readings, the ECP35.31 has Boiler and the EC685M is having thermoblock. I understand that the EC685M with thermoblock will definitely get ready faster when it is switched on, which from some review mentioned it’s about 30seconds. I would like to know what is the time required for ECP35.31 to be ready for use when it’s switched on. It’s about 110 seconds from switching it on to the moment when “ready for coffee light” comes on. However, it’s recommended to wait several minutes more or run water w/o coffee to warm up the machine better. After the machine is ready for coffee it takes about 45 seconds more to heat up for the steam mode. Generally speaking, it’s the same machine but with different milk frothing systems. The 350.35 is equipped with manual panarello wand, not automated. Some people can handle it, on the other hand – an experienced user can froth milk manually better than automated frother does. So, if you sure you are OK with it (see embed video in this review http://101coffeemachines.info/delonghi/ec-680-dedica/ ) than I see no reason to buy a model with automated milk jar. he Delonghi 350.55 and 350.75 – both with automated milk frothers. The difference between them is basically in two more “recipes” (programmes) that 350.75 has (and 350.55 doesn’t): it’s “cappuccino+” and “espresso macchiato”. I wouldn’t choose 350.75 is the price difference is high, the 350.55 seems to be the golden middle for me. All three models have the same bug reported – the frother could stop working after the descaling cycle. No need to take it to the service (Delonghi support will give instructions over the phone how to fix it), however, it’s better to be sure that the machine you’re buying is under warranty. Hi got Delonghi 3630 after reading the reviews. But after setting up the system and cleaning it ( greed light came on ) now when I tried to make coffee it does not turn green even after one hour. While we can make a cup it does not come out hot so obviously something is not working. What am I doing wrong? 1) When you are making coffee it’s not hot, but at least warm? 2) If you will try to make steam (steam wand mode) – will the machine turn the green light, will it deliver the steam? 3) Could it be some voltage problem? E.g. you are using european 220v machine in the country with the 110v infrastructure? EX: ECAM650.75, how many cups per day or per hours it can make coffee. HIya, my EC31.21 is leaking wate as soin as I switch it on. Any suggestion on how to fix it please? Dissasemble (it is quite easy, ordinary screwdriver is needed, start with the bottom) and check all the water rubes connectors. There is no “hidden” places, so once you will remove the upper body part, everything will be reachable. I just found out about your site and I absolutely love it! Thank you for keeping it up. I have a question regarding the material of which the portafilter is made. I am trying to find an espresso machine with no or minimum aluminum. I was glad to find that Delonghi use a stainless steal boiler. How about the portafilter? Hello Dmitriy and thanks for your reply. I ended up buying the Delonghi EC 35.31 model and I am very satisfied with it. However I am interested in ways to replace the plastic spout inside the portafiler. Do you happen to know where I can buy one from stainless steel. Thanks! “if I just run water it drains” – with the holder installed or not? Then it’s definetly something wrong (pump most likely or emergency water bypass). I’ve just bought a 35.21 model. I’ve set it up as recommended, and now am struggling with a problem, that when I’m trying to make espresso, most of the water is staying in the portafilter and only a bit of it is leaking down to my coffee mug (as coffee 🙂 ). Common sense is telling me, that it might have something to do with either pressure, or amount of coffee I’m using. However I use the recommended 1 measuring spoon of grinded coffee and can I even influence the pressure in the machine? I wait for the green light to go off before making the coffee, which is presumably the moment when the pressure is the highest. Could you please advise what I am doing wrong here? Thanks! The green light has nothing to do with the pressure, since this machine is pump-driven, not steam-driven. You can’t change the pump’s pressure. Overall, everything is normal. The water will always stay in the filter, because the main pressure limiter is a tiny hole in the filter, which goes after ground coffee. However, it seems that you put too little ground coffee or use 2-cup filter basket for one portion. Because normally there should be (almost) no space for water in the filter, it should be fully filled with ground coffee. thanks for a quick response 🙂 Thing is, I’ve tried it with different amount of coffee, and even different type of ground. Checked the coffee basket and the filter as well. Still the outcome is – coffee is painfully slow dripping from the machine 🙁 and when I’m trying it without any coffee it works well, so seems like it literally can’t press this water through the coffee… Still can’t figure out what’s wrong with it (or me 😀 ). Wish I could attach video here. Do you think I need to contact service center about it? The EC702 is for sure the better choice – it has two thermoblocks: one for coffee and one for the steam. That means you will need less time to switch between coffee brewing and frothing (or vice versa). See also my Delonghi Dedia Review to read about boiler vs themoblock differences. I also find the EC702’s panarello more comfortable to use. The only con about Delonghi EC702 is that it has ‘old’ filter baskets, which create better crema, but are more likely to become clogged with extra-fine grind. The EC860/865 is better only in terms of sizes and automatisation (auto dosing). EC702 still will be faster if you are making cappuccinos, because of the less pauses between coffee and cteam modes. I have a ECP 3420 model and I was wondering if it’s an issue if I left it on steam for an hour the other day. Would the boiler get too hot and melt the wires inside?? Also there is some black/dark debris coming out of the boilerhead if I run water through it. Is the machine in need of descaling? It’s not an issue, the machine has a thermostat, which doesn’t allow it to become too hot. Nevertheless, if you regulary left it on steam mode after you used a wand, it’s better to run water for a while to fill the boiler again. The thing is when you use a steam wand, the steam come out, and there boiler becomes filled with a little of air. That’s why it’s better to fill it again with water to prevent unnecessasry oxidation. This is not a scale, this is small particles of coffee that are stucked in the group head or in the boiler valve. On the professional machines they use a blind portafilter (filter basket with no holes) to clean it. On home machines you can clean it with cotton bud for example. For better cleaning you can also unscrew and clean the valve. It’s a bolt in the center of the shower screen (be careful not no loose the spring that will fall out after you unscrew this bolt). Hey! love your site. I was picking between ECP 35.31 and the EC685. I would most likely be making lattes and cappucinos, which would you recommend? Thanks! For lattes and cappuccinos the EC685 (or EC680) would be more preferable. Love the review, it’s very thorough and clear, very useful for early adopter (like me). Local stores in my country offers bundling package of ECP 35.21 with the grinder KG98. What I’ve read about the grinder was it’s not suitable for expresso and yet several stores offers this bundling set. My question is, would the grinder is the perfect companion with the ECP 35.21? If not, do you have economic value alternatives for the grinder? The KG89 grinder indeed doesn’t grind fine enough for ‘real’ espresso – for unpressurized (single wall) filter baskets. However, ECP 35.21 as any at-home espresso machine is equipped with pressurized baskets. This means that this is rather a good pair – both machine and grinder are of the same class. The next level of grinders (real burrs, not ‘fake burrs’ like on the KG89) costs much more (cheapest example: Solis Scala, Rommelsbacher EKM300, Delonghi Dedica KG521). Anything cheaper would be no better than this KG89. This, if you are not planning to buy expensive real burr grinder and if you are not planning to experiment with unpressurized baskets, then it’s a good choice. P. S. There are many alternatives of the KG89 grinder, which uses the same burr set, but costs cheaper, however, they have different names in different countries. In the States it is Secura SCG-903B (https://amzn.to/2Rssd5m), but I don’t know what country are you from? i got question, if the options are Delonghi ECP 35.21 and Gaggia Viva home deluxe(Is this Saeco Poemia in disguise?) which one is better? or any other alternatives for home espresso maker? and whats your take comparing these machines to Manual espresso maker like flair? Hi, Donny, yes, you are right – Gaggia Viva is rebadged Saeco Poemia (with smaller boiler and external heating element). I recommend it (Gaggia) for espresso drinks or ‘mainly espresso and sometimes cappuccinos’. If you drink only cappuccino – then Delonghi’s panarello would be more preferable. hey, i’ve got delonghi ecp3420. i plugged it into 220volt instead of 120, the heater doesnot work, can anyone help me where to find spare heating element part of any delonghi ECP series..? as i discovered all these models come with he same parts inside..
Delonghi doesn’t produce heating element as a replacement part (and even they would, it is too complicated to change it). What you can buy is an assembled boiler with a heater inside. The part numbers to search for are 7313286879 for 230V and 7313286989 for 120V. Don’t be confused with the fact that on English diagrams these parts are called “STEAMER”, it’s just a translation mistake, because on Italian diagrams it clearly says “CALDAIA(COMPLETA)” (boiler assembled). Thanks for a fascinating insight into the design and internals of these machines. Really appreciate this as an electronics engineer. I’m searching for a good quality budget but reliable machine for making Cappuccino’s only. You seem very impressed with the 680/685 range particularly in view of the Thermobloc heating. Automation is less important I’d rather have reliability. Basically I’m searching for the closest to a high end machine but with a budget of only £150 (approx.) Which of these machines can produce the best drink ? Thanks in advance for your advice. I wouldn’t recommend Saeco/Gaggia (too small boiler for cappuccino making, they are better for espressos), Breville/Sage (costs more than your budget + problems with spare parts on the long distance), Ariete (cheaper sub brand of Delonghi, boiler is made of aluminium instead of steel + weak panarello for only cappuccino drinker) or any OEM Chineese espresso makers like Excelvan, Swan, Hailton Beach etc (low durability, cheap material used). Among the rest you can’t find something that could be really called “closest to a high end”. Any of them would be typical machine for home use without any professional features, but you can still make decent cappuccino on it. 1) You mentioned the Delonghi EC680, if you have no experience in frothing milk manually. It will be easier for beginner to froth the milk (panarello wand and longer steam because of thermoblock), but it’s impossible to make latte art, too many electonics and the thermoblock = less realiable on the long distance. 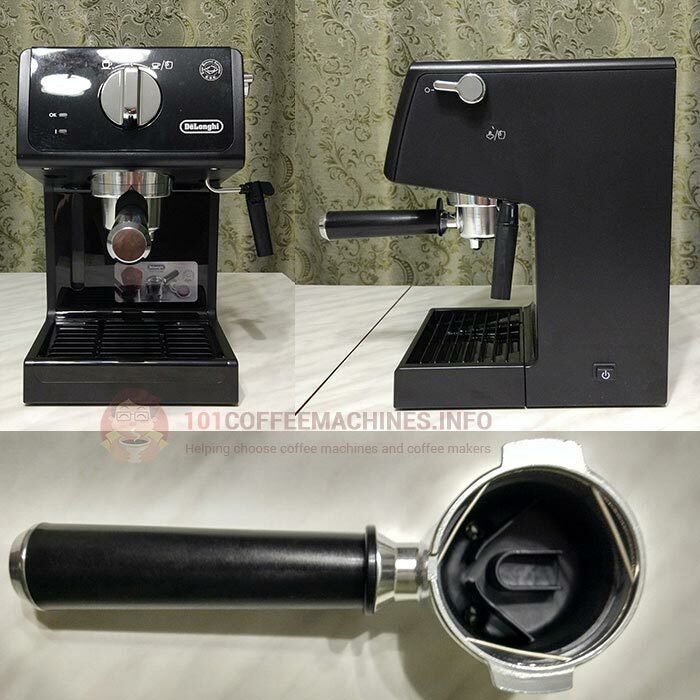 2) If you do have an experience in frothing milk or if you are sure that you will handle the classic steam wand – http://101coffeemachines.info/krups/calvi/ You can really make a cafe quality milk foam on this machine, better than on classic panarellos. But needs some time to practice. Plus the machine itself is very plastic. 3) Classic Delonghi with big boiler. Generally they all are identical. 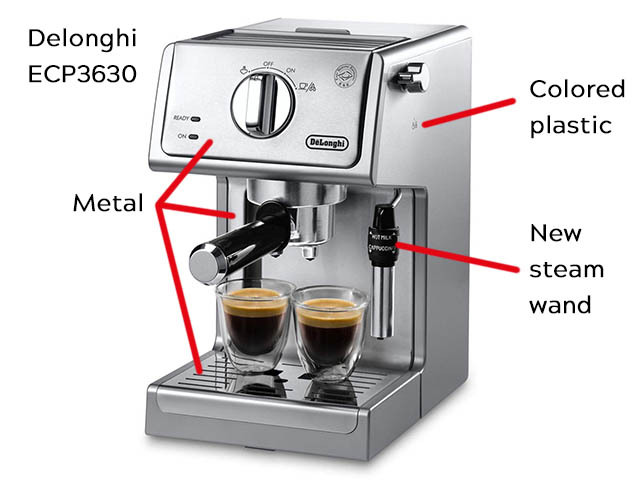 But the ECO311 seems the best one for me: http://101coffeemachines.info/delonghi/eco310-311-icona/ metal body, high cup clearance, and the panarello wand better than on EC680 (not only because of the shape, it’s more comfortable to use it becuase of it’s location). Resume. If you not sure then the EC680 is a universal choice (and that’s why I frequently suggest it), equally good in all the aspects (but not superb). If you are sure that you want to make focus on something, then it’s Krups Clavi (best milk foam) or ECO311 (the durability and classic construnction).